From scramble and steaks to curry and baked, tofu is one of the most versatile, healthy and protein-rich ingredients you can cook with. However, the condensed block of soy often gets a bad wrap being cited as tasteless, hippie food and well, a bit weird. Thanks to a new and innovative company founded by two veggie entrepreneurs Adam and Suse, both opinions and the future of tofu are being transformed. The concept for Tofuture was born as a result of a rather unfortunate mis-hap in Suse’s back garden involving Adam, a trampoline and broken ribs. While Adam lay on the sofa recovering, Suse went to work leaving a block of tofu draining in the typical way; under a pile of cookbooks, a heavy chopping board and a few tins. And as it so often does, the whole structure collapsed to the floor, leaving an injured Adam to painfully save what he could from the soggy, tofu-carnage. It was then they realised, there really has to be an easier way to drain tofu. 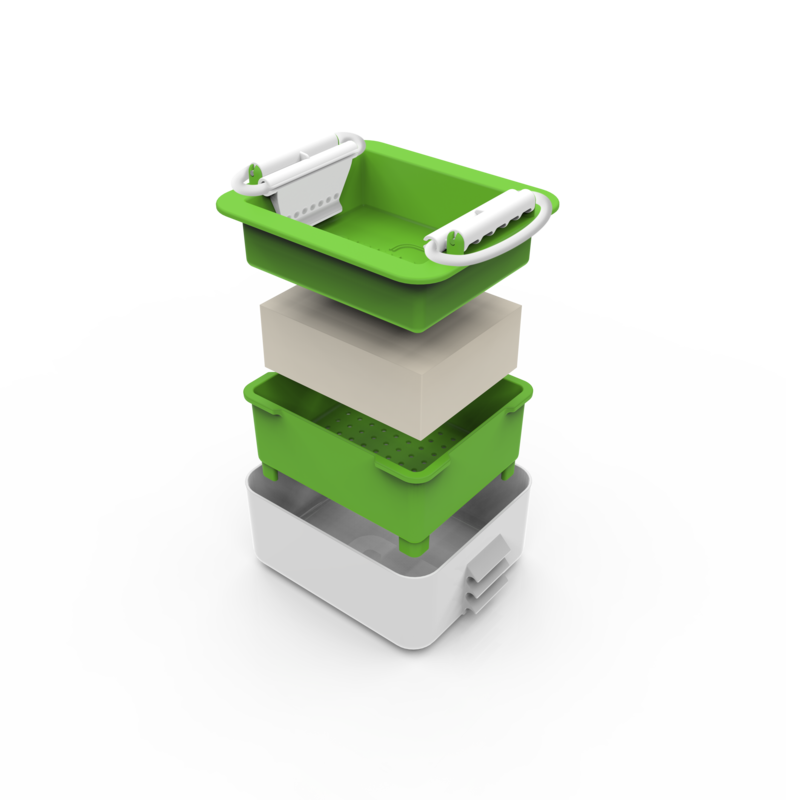 And so the Tofuture’s revolutionary Tofu Press was launched and once you’ve tried it, you’ll seriously wonder how you’ve managed for so long without it. The Vegan Society approved product is beautifully branded, with clean and modern packaging and couldn’t be easier to use. The stylish, handy-sized box (W14cm x D12cm x H7cm) has three compartments. 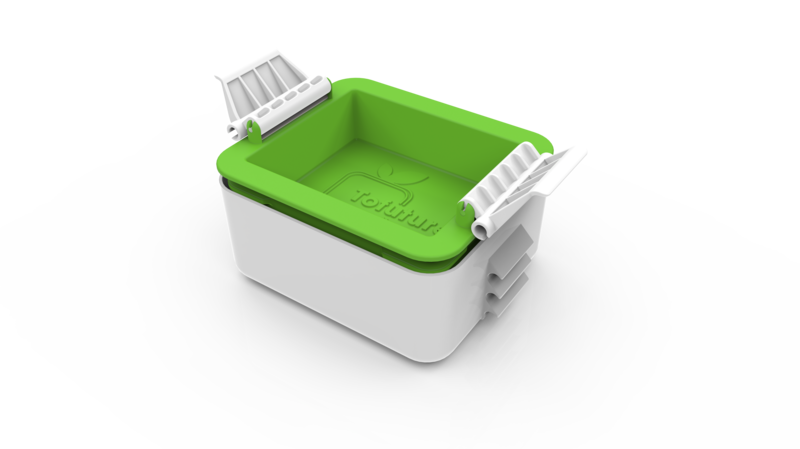 You simply place your block of tofu in the middle tub with the drain holes, put the top tub back on and pull the elastic bands down, over the hooks and flip the handles down. See the how-to video tutorial here. Leave the press in the fridge (see the website for suggested timings) and remove once you’re ready to cook. The top compartment can also be used for marinating your tofu, check out Tofuture’s list of mouth watering tofu based recipes to whet your appetite. 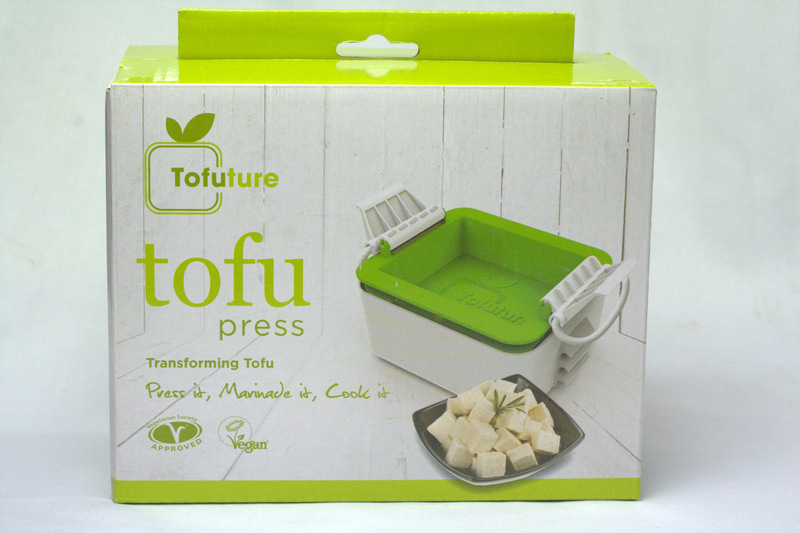 The Tofu Press is available to purchase at £24.99 via the website and from Amazon in the UK, Germany, France, Spain and Italy. Don’t just take our word for it, you really will wonder how you’ve managed without one for so long!